Playing along like the soundtrack to a movie set in the desert, late at night, while two lovers search for something other than baron land. 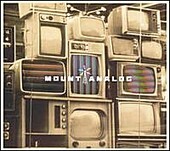 Mount Analog's New Skin paints the perfect pictures scenes, unfolding slowly and methodically. Though somehow still managing to create a full, semi-lush soundscape that will swell inside your mind and fully consume you, the dazzling, brilliantly laid out sounds colliding with the right amount of atmosphere, subtly the name of the game, and so much happening under that guise. Layers and layers mixed with air and time make this a gentle record, one that is easily absorbed. The perfect background music, and so much more. It actually draws your attention, even when it is only playing in the background. I'll give it a B+.